So many new lawn care business owners pause at the moment when a decision is required of them. Or they fail to plan how to handle future growth. In haste, a poor decision can be made due to a lack of experience. Such indecisive or poor decisions can prove costly. After reading this book, you should have a solid, well rounded perspective on a broad range of topics your lawn care business will be facing in the future. Knowing how others have previously handled situations can give you a definitive advantage over competitors. Knowing what works and what doesn’t will keep your business moving solidly forwards. As you move ahead, I hope you find great joy and excitement with your business. You can make it happen. Improving your bidding & sales. Keeping your life in balance with your business. 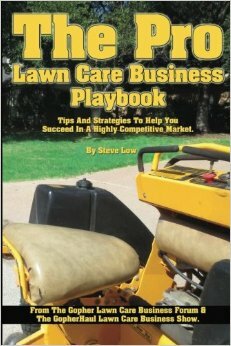 If you would like to read more about how to improve your lawn care or landscaping business, check out my many other lawn care business books.